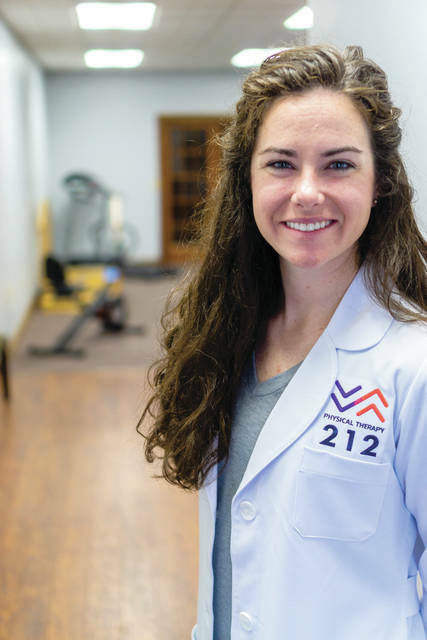 Provided photo Dr. Kristen Schulte is owner of Physical Therapy 212, which will celebrate its grand opening on July 24. TROY — A new physical therapy clinic opening next week, operates on the idea that a small change can make a huge difference. Reflecting that philosophy, owner Dr. Kristen Schulte named the clinic Physical Therapy 212 after the temperature at which water boils. Physical Therapy 212 will hold its grand opening from 3-7 p.m. on Tuesday, July 24. The clinic is located at 10 N. Market St. in Troy. “It’s not your typical physical therapy clinic,” Schulte said. Schulte takes a hands-on, osteopathic approach to physical therapy. She specializes in manual therapy and dry needling for immediate pain relief and teaches patients corrective exercises to help provide long-lasting results. A recent graduate of the University of Dayton, Schulte opened her own clinic because she has a “very specific idea” about how patients should be treated. Oftentimes with the constraints of insurance, patients aren’t seen for a long period of time and sometimes multiple patients are being seen at the same time, Schulte said. At her clinic, she treats each patient individually for 55 minutes at each session. A former cross country and track athlete at Xavier University, Schulte sustained a low back injury that was projected to end her running career. Pursuing alternatives to medication and surgery led her to earn a doctorate in physical therapy at the University of Dayton. Schulte, who is from Versailles, chose Troy for its sense of community, she said. Physical Therapy 212 is open from 8 a.m. to 6 p.m. on Monday, Wednesday, and Thursday, as well as by appointment on Saturday. https://www.tdn-net.com/wp-content/uploads/sites/21/2018/07/web1_Schulte-Headshot2.jpgProvided photo Dr. Kristen Schulte is owner of Physical Therapy 212, which will celebrate its grand opening on July 24.